A few months back, Fred shared how we installed painted pegboard in our new workshop to give it a dramatic flare. Before we put up the pegboard, we painted it (and its mounting strips) semigloss black with this Graco TrueCoat Plus Paint Sprayer. In Fred’s original article we promised a review of the paint sprayer. Well, this review is long overdue, but today I’m finally sharing our experience with the Graco TrueCoat Plus, which was provided to us for review by Graco. 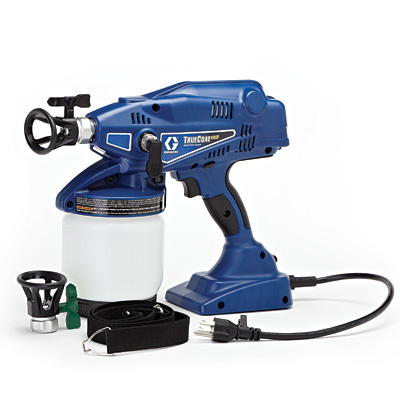 Graco offers a number of professional and consumer grade sprayers. 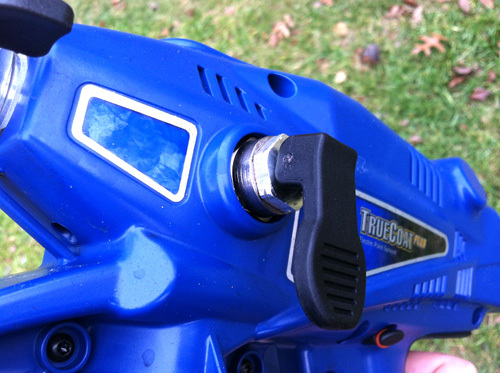 The TrueCoat Plus model is a small, portable, handheld sprayer designed for the do-it-yourselfer. It’s available as a corded or cordless model, and it costs $250 at Lowe’s. We tested the corded model. When I evaluate any painting tool, I always look for the following traits. Below I take a look at how the Graco stacks up against each of these factors. Flushing involves removing a few parts from the base of the tool, running water or mineral spirits through the sprayer, and then reassembling the unit. A simple flush takes about five minutes. The TrueCoat Plus cleans up relatively quickly as compared to paint sticks, and even as compared to competing sprayers. Reassemble the parts and run water through the sprayer, rotating the nozzle between the spray and unclog setting. 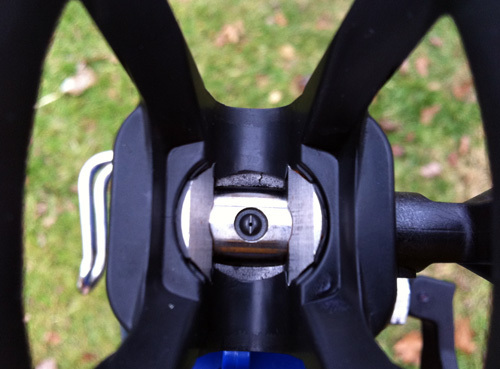 Remove the nozzle (reverse threaded) altogether and give it a thorough cleaning. If required, re-rinse the cup and fill tube. I found the cup liners broke after refilling the cup a few times because they go right over the threads for screwing the cup in place. It’s almost not worth using them. Also, I learned to spray the water / mineral spirits longer than the recommended 15 seconds, otherwise the unit doesn’t really clean up entirely. I’d estimate clean-up takes 15-20 minutes after you know what you’re doing (and not staring at the directions like I was). That means the TrueCoat Plus is worth breaking out even for smaller jobs. Storing the sprayer for an extended period of time involves a few extra steps, because water left in the sprayer will corrode the pump. Graco includes one bottle of “Pump Armor”, and that needs to go through the sprayer after cleaning. I’m disappointed that I’ll need to keep a supply of Pump Armor concentrate handy for this sprayer; however, the TrueCoat Plus cleans up nicely. The real proof is that I’d definitely use it again for our next spray job. I was really impressed with how fast I was able to work; it took mere minutes to paint everything. Unfortunately, I went through a lot of paint, and that meant stopping to refill the paint cup repeatedly. Obviously a bigger paint cup would mean the sprayer is heavier when full, and Graco opted for increased portability. It’s also important to know that I couldn’t angle the sprayer too far because the intake tube needs to sit in a pool of the paint or stain. Several competitors have designed a tube that flexes to address this problem, but the TrueCoat Plus does not have that feature. The TrueCoat Plus is an airless sprayer, and that means the pump atomizes the coating rather than mixing the paint with compressed air. 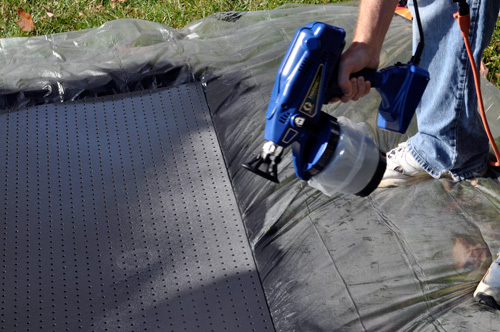 Airless sprayers enjoy a few perks over air sprayers, including a more uniform coating and better fill for crevices (or, in our case, pegboard holes). They also don’t need any thinner additives, which is a major plus for an on-the-go type of sprayer. I found the the TrueCoat Plus has good power and range. I was able to position the sprayer about five feet away from the work surface, and had no problems with overspray. Overall, I enjoyed how quickly I was able to paint everything, and the finish looks great. The TrueCoat Plus can handle several different spray materials, and I really like that you don’t have to add any thinner. It was cumbersome to refill the paint cup so often and to remember not to tilt the sprayer too much. For those reasons, the TrueCoat Plus has limited applications, such as painting trim, fixtures and shutters. 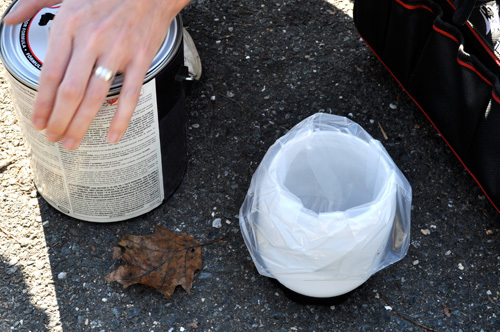 It could work to paint or stain a fence or deck, but I’d hate to refill the paint cup so many times. Setup and clean up is easy, which makes the TrueCoat Plus a real time-saver for small projects. What’s Included with the Sprayer? Fred owns a Wagner Airless Paint Sprayer. 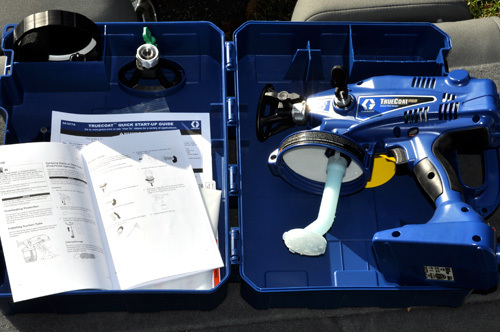 Read his review to see how it compares to the Graco. Any idea what the pump armor actually is? It would be a lot more appealing if it was something cheap that could be found at the hardware store. antifreeze?? which should have rust inhibitors in it. You’re right! It’s premixed antifreeze. Although some automotive mixtures have a diethylene glycol in small percentages as well. yeah… some guys just talk about storing it with mineral spirits in it to remove the corrosive nature of the water. This is useful info. So, on my Wagner with the hopper on the ground, I kept running into rust issues with the valve at the base of the hopper. Sounds like what I needed was a final rinse with something other than water. Wish I would’ve known. I got so sick of the problems with it, I ended up recycling it. About to start helping family paint their new construction home. I know this specific sprayer isn’t what we should consider buying since we will be painting the entire house but should we consider buying a larger sprayer or renting from our local Home Improvement store? If we should consider buying, any past reviews you can point me to? Fellow commenter here but I can weigh in on your question. Be sure to compare the rental cost vs the time you estimate it will take you to paint the house. Double your time estimate as well and compare that to the rental cost. You most likely would be able to sell the tool on craigslist or equivalent when you are finished and recoup a significant portion of your initial cost. I’ve done that with plenty of specialty tools. Secondly, I think today is the first I’ve seen you comment here. Welcome to OPC! There is usually good discussion on almost every article. I hope you registered for Project Rewards. You can get points on every article you comment on as well as just being logged in. It’s a free way to get free tools! Thanks for the comments and suggestions. I hadn’t even thought about reselling it! I just found OPC last week and already joined Project Rewards. I’m all about free tools! I know Fred has had a good experience with a Wagner, and it sounds like a good option to consider. Check out his Wagner review here. And if you follow Jeff’s suggestion, it should be an inexpensive investment. Is the Wagner review still up? The link is broken and I can’t find it via google. Hey Carrie, Unfortunately, we nixed the Wagner review. I believe it was the same one as this (from the Wagner site). Hope this helps. i’m assuming the spray gun fan tip is removable (the one you turn for unclogging and cleaning)? if it is, then most likely its the same tips used for the industrial line of Graco sprayers and that would make it an awesome feature since you can purchase different size fan tips at Sherwin Williams and i believe Home Depot or anywhere they sell Graco Products. You’re right that the tip is removable, and they include an alternate for a wider pattern. Are the industrial sprayers reverse threaded too? Let me know if you find out more. This looks handy for a crafter working with wood, like bird houses or bird feeders, before assembly. I’ve bought and returned 3 graco truecoat plys sprayers. Customer service was terrible and could not give me any information on why they sell a paint sprayer that does not work or breaks as soon as the warrenty is up. I just opened the third sprayer after buying and returning the last one and it was broken right out of the package. Dont buy this product. It is terrible. I feel like money has been stolen from,me because of how terrible this truesprayer plus is. Thanks for the real time review of paint sprayer. I do a small amount of DIY stuff and am looking for something like this. Other than the time for cleanup I will seriously look at this now. I rebuild bicycles, use car paint applications or epoxy for rebuilds. Looking for something easier to break out that my current compressor / gun. Will this work? I wouldn’t have to mix down the paint anymore with this?. If not any recommendations for new hardware ?